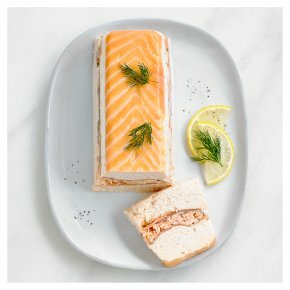 A terrine of poached salmon mousse, poached salmon and marinated smoked salmon, garnished with dill. INGREDIENTS: Poached salmon (48%) (salmon (fish)), smoked salmon (12%) (salmon (Salmo salar) (fish), salt, demerara sugar), full fat soft cheese (milk), water, butter (milk), rapeseed oil, whipping cream (cream (milk), stabiliser (carrageenan)), fish gelatine, pasteurised free range egg, dill, sea salt, concentrated lemon juice, sugar, acidity regulator (acetic acid), salt, mustard flour. For allergens see ingredients in bold.